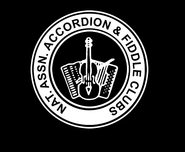 The National Association of Accordion and Fiddle Clubs is a national association of clubs dedicated to Scottish traditional dance music. In approx. 70 clubs in Scotland and Northern parts of England, players and audience meet monthly to share their love of this type of music. If you can play you can bring your instrument and have a tune, or you can choose to sit in the audience to listen to a wide variety of players and instruments and await the highlight of the evening, the entertainment from the talented guest band, hired specifically for that occasion. Several hours of live music in a friendly atmosphere, what else can a body wish for? 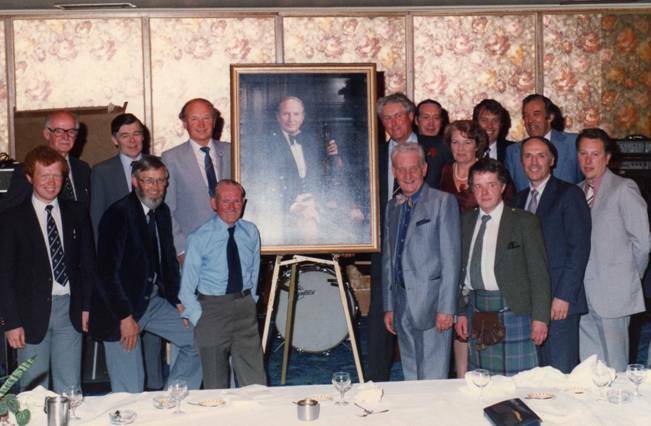 The NAAFC began in June 1971 with an exploratory meeting in Perth followed by the inaugural meeting in the Station Hotel in Ayr on 4th July with 9 clubs represented: Perth, Gretna, Straiton, Langholm, Dundee, Newcastleton, Dumfries, Galston and Milngavie. From the very beginning the season ran from September to May and this is still the case for many of the clubs. The end of the season is followed by the AGM and an award ceremony held on the last Sunday in June. This is an event that brings many together to celebrate the fact that the association is still as strong as ever. Over the forty years of the Association’s existence, there have been a very small number of people involved in its management. 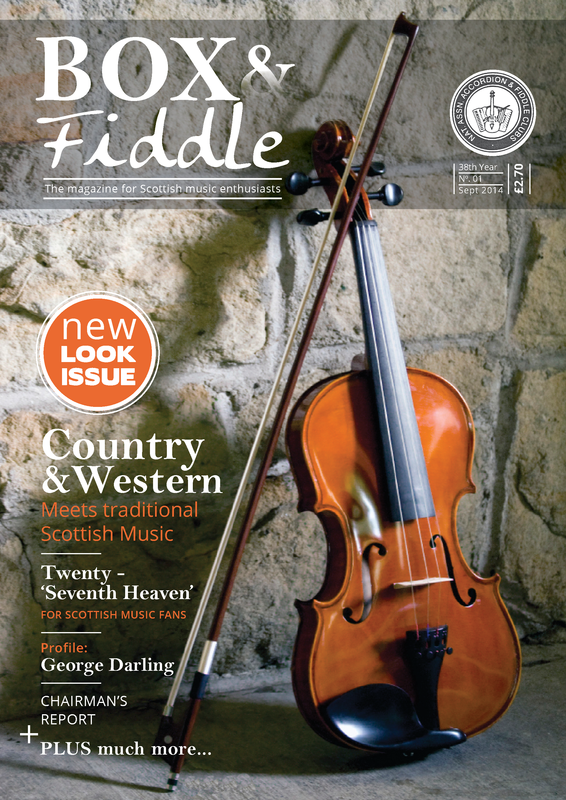 Clubs and their members are kept informed through a magazine, Box & Fiddle, and this website. The magazine has over the years developed from a humble circular with information to secretaries to today’s exciting colour format with news not only about what has taken place in the previous months, but with articles, adverts, photos, news and listings of guest artistes and a monthly diary. 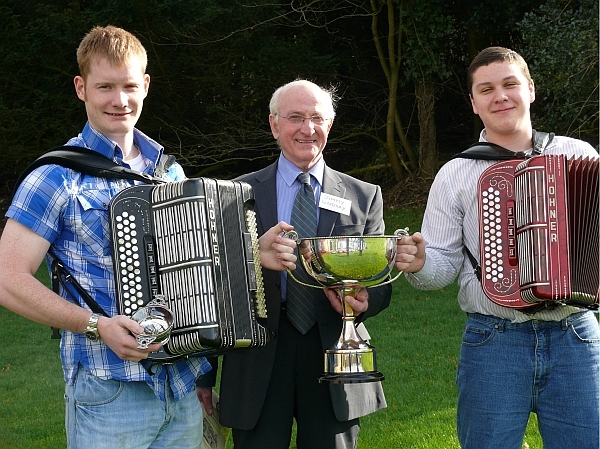 2012 competitors Graeme Mackay (left) and Brandon McPhee (right) with adjudicator Jimmy Lindsay. The NAAFC is responsible for organising the annual NAAFC Festival (formerly held in the Brunton Halls, Musselburgh) but now well established at Inchyra Grange Hotel in Polmont. 1st March, 2014 marked the 40th Annual Festival which started from humble beginnings of only a few sections to the major event that it is today, drawing competitors from all over the country. Three volumes of music by the late Angus Fitchet and “The Border City Collection” – a book of Felix Burns compositions, have been published by the NAAFC, thus ensuring that the music of these long gone maestros can be preserved for enthusiasts across the globe for years to come. More recently the NAAFC has been the proud sponsor of the “Scottish Dance Band of the Year” Award at the annual MG ALBA Scots Trad Music Awards since the inception of the awards in 2003. The NAAFC Annual Golf Day began in 2011 and takes place in June each year at Dunblane Golf Club with the golfers competing for the Billy Thom Challenge Trophy.